Yomi: Complete First Edition comes with all 10 character decks, each with their own artistic tuck-box and 1-page rules insert. Yomi cards are printed on the the flexible type of stock used for playing cards, and they have playing card coating. This makes them more durable, better for shuffling, and gives them a similar tactile feel to playing cards. Yomi is the Japanese word for “reading,” as in reading the mind of your opponent. 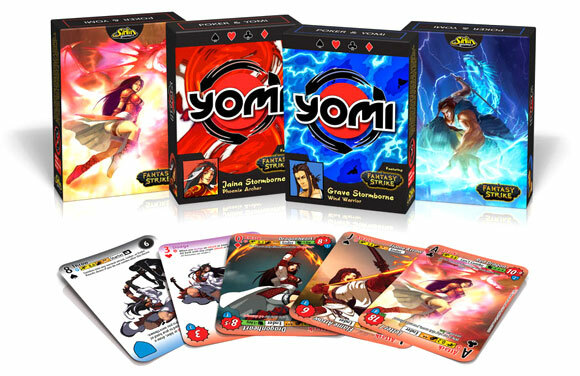 Yomi: Fighting Card Game is a simple competitive card game that simulates a battle between two characters. Each deck in Yomi represents one character and can also be used as a regular deck of playing cards with beautiful artwork. Champion fighting game tournament player and game balancer David Sirlin designed the game to test the two most important skills in competitive gaming: Valuation and Yomi. Valuation refers to your ability to judge the relative value of moves (or cards) as they change over the course of the game. Yomi, the game's title, refers to your ability to guess which moves your opponent will make. There is more to it than guessing, though: some players have the uncanny ability to “guess” right almost every time, no matter the game. There are 10 different decks in Yomi, each one represents a different character. Decks have 52 cards + 2 jokers + the Fantasy Strike character's card. Try out several to find the playstyle you like the most. All characters are balanced well enough that any can win a competition. Exploring the 55 different character matchups is where a lot of the fun and depth come from. Yomi decks come pre-built, each with strengths and weaknesses. Just get two decks and start playing right away. Also, the decks don't change over time so if you learn the game once, you can play it for years without worrying about your practice going to waste. A look at what's inside the box of the Complete First Edition of Yomi. This is a fantastic 2 player card game. Each player draws cards from his deck and plays, from his hand, an attack (rock), dodge/block (paper), or throw (scissors). Winning a faceoff gives you an opportunity to do damage or to draw more cards to refill your hand. Inside there is a very practical insert cradling 10 decks, two play mats, a few tokens to track health, and the well-written instructions. The ten decks each have a different fighter, most of whom are human, but some of whom are, well, not. A giant panda, for instance. The art, theme, and mechanics all remind me of Street Fighter 2 and other arcade games from Back in the Day. Each of the ten decks plays distinctly from the others. The more you know – about your opponent, about your deck, about your opponent’s deck – the better you will be able to predict his next move and play the correct counter. And *that’s* what this game is about: guessing your opponent’s plan and trapping him. No review of this game would be complete without mentioning the art. It pervades the game: the box, the mats, the boxes of each deck, and each card has its own artwork. The Panda’s 9’s are different from the Artist’s 9’s. Each deck is also its own set of traditional cards, they are numbered and marked with the four suits of a traditional deck of cards. Why you would play poker with these cards I couldn’t guess, but it’s a nice touch. A weaker opponent will find himself terribly frustrated with this game. You *have* to be able to assess what your opponent is going to do, if you blindly over and over make the obvious choice a superior opponent will make your temper start to flare. The ten decks give you as much variety as you could want. The art is gorgeous and the theme is well delivered. The instructions are well written and the game is easy to learn. The single biggest problem with this game, without doubt, is availability. The edition pictured here, the 1st Edition set of ten decks, appears to run a hefty $100, and individual decks appear to be available for about $10 each. Not cheap, though it should be plain enough from this review that I think there’s a lot going on in here. Recommended, if you can track it down & get it for yourself. Yomi is a two-player competitive card game that is meant to simulate a fighting game, such as Street Fighter or Tekken. The goal of the game is, quite simply, to reduce your opponent’s health to 0. The name ‘Yomi’ itself is Japanese for ‘reading’, as in reading the mind of your opponent, which is a skill especially important in high-level competitive play. The game itself is played with any two decks of 54 cards; each deck represents a character and doubles as a standard deck of playing cards. Each card has two moves, one on the top end and one on the bottom. Thus, the hand that the player draws represents the actions they can take on their turn. There are ten decks in all. The game’s main mechanic boils down to rock-paper-scissors. On each turn, each player puts down a card; this is the action they’re going to take this turn. Simultaneously, both actions are revealed, and the winner of that round of combat is determined. Without going too deep into the mechanics, attacks beat throws, which beat blocks and dodges, which beat attacks. “But Akvo,” you may protest, “if this game is nothing but rock-paper-scissors and you can only put down what’s in your hand, where’s the strategic depth?” Well, my dear reader, curb your suspicions and doubts for the moment. Each character’s deck is different. Some characters excel in stringing attacks together to deal heavy damage. Others are proficient at throwing but have less defense to make up for it. One character even relies on luck to throw the opponent off guard! (That one’s the panda.) In other words, while rock-paper-scissors is a game where each option has equal merit, psychological choices aside, the attack-block/dodge-throw paradigm means that each option you choose has different strategic merit, with potential long-run repercussions. Both these concepts together make for a very fun game. But how are the actual components? The cards are nice and sufficiently glossy. They aren’t laminated like professional poker cards, but they certainly are very high-quality. The art on the cards is well-done as well, and are pretty darn nice to look at. I find that the boxes aren’t quite of the same quality–they’ve already been quite worn from keeping them in my backpack. I can’t comment on the extras the deluxe version contains. Pricing is set to roughly $10/deck, which are sold in packs of two; the deluxe edition, which contains all 10 characters, a rulebook, and two playing mat with stones to mark life is $100. Since the game is independently published, it might be difficult to find it in a brick-and-mortar store. I’m told that the import price can also be a bit hefty. Perhaps the most negative thing I can say about this game is that its learning curve is steep. It will take you many, many games to have the game finally ‘click’ for you; otherwise, it will seem a bit like, well, rock-paper-scissors. It might be difficult to convince a friend to play if he’s not willing to invest enough games; it’s downright frustrating if they dismiss it as ‘just rock-paper-scissors’ and refuse to play anymore. Considering the steep disconnect between starting out and finally understanding the depth of the game, I recommend playing on the Fantasy Strike website, where you can play online for free with a weekly rotation of ‘free-to-play’ characters. This is probably the best way to try and see how it’s like; after all, $100 is a lot of money. All in all, I find Yomi to be an excellent competitive card game. It mixes a good blend of strategy and luck to keep it exciting, and it fits with the theme and world. The art is pretty, the cards are relatively well-built, and it really does feel like a fighting game. However, its steep learning curve might turn casual gamers off to it. The designers of Yomi have everything you need to replay your Street Fighter glory days — colorful fighters, excellent art, and brutal combos. While a bit lacking in the backstory, this game more than makes up for it in its simple mechanics and quick-thinking, rewarding gameplay. The game revolves around a rock-paper-scissors mechanic, with Throws – Attacks – and Defenses (Dodges/Blocks), with Supermoves and Jokers thrown in for a fighting style quite reminiscent of Guilty Gear X2 # Reload, for you fans of the fighting game genre. Many different character styles and a slew of interesting options leave you with the closest I’ve ever seen a card game come to emulating the video games they seek to mimic. Yomi is also a fighting game, and uses the same ten characters as Puzzle Strike, a game also by Sirlin. They’re both set in the Fantasy Strike universe. 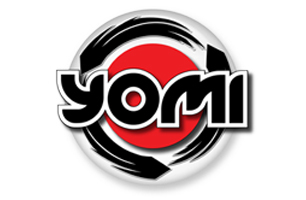 Yomi: The Complete First Edition primarily consists of ten 54-card decks. The decks have poker numbers and suits, and can each be used as a standard poker deck, including jokers. Perhaps the first thing you would notice about this game is the art. The art is fantastic, and will remind you somewhat of the Street Fighter franchise. Each deck has about 15 unique and excellent pieces of art (all cards are illustrated, some repeat), plus a unique card back for each character. The decks are beautiful… and the game play is pretty simple. Each player selects a card, that will either be a Throw, Block, Dodge or Attack. You reveal them and compare: Attack beats Throw, Throw beats Block/Dodge, Block/Dodge beats Attack. Sort of a Rock-Paper-Scissors thing. Once you determine the winner of the reveal phase, you can potentially play other cards to combo. You then subtract damage and go to the next round. Each of the 10 characters feels different, and each has their own powers and combo strategies. This game is definitely worth checking out. Inspired by the many different fighting games that people can play in arcades and on gaming consoles around the world, Yomi is an incredibly simple and fast-paced game of wits and strategy that pits your character against an opponent. In Yomi, players will choose a character and their pre-constructed deck. You are not able to mix and match cards from one deck to another, so the deck construction is pretty straight forward – you get what you buy and you don’t need anything else to play that character. Each character has their starting health and an ability that can range from things that help you attack, defend or draw cards or more. In its initial release, Yomi has something like 10 (I think) character’s that you can choose from – each with their own unique play styles, strengths and weaknesses. For example, you have Satsuki whose charactter ability allows you to draw cards from your deck until your hand equals a certain number if you have 1 or less card, or Jaina who allows you to take damage to keep your face cards. This leads me to the actual gameplay for Yomi. What I like about the game is that the gameplay is extremely straight forward, while still having lots of tricks that you can play. With the game, players will place a card face down, then flip it. You compare the type of card with another to decide who wins. The basic mechanic of the game is a lot like Paper-Rock-Scissors on crack. You have five card types in essence – Attacks, Throws, Blocks, Dodge and Jokers. Blocks and Dodges beat Attacks, Attacks beat Throws and Throws beat Dodge/Blocks. While the basic design is fairly straight forward, card effects will allow for a greater deal of variation and strategy to be tossed in. Each card can be played for two different effects (usually). You can play a card for one effect or another, and then some cards have additional effects that allow for more decision making and play consequences. Do I want to Attack or do I want to block? Throw or Dodge? To play effectively, you need to be paying attention to what your opponent is playing and find a way to essentially counter their play style with yours. Some match ups are good, others are bad – but the overall game is very strategic. The art work for the characters themselves are a wonderful anime-video game inspired style. The face cards (which represent the most powerful cards for your character) along with the character portraits are very well done in my opinion, but then again I really enjoy that kind of art style. The gameplay is something I really enjoy too – a fast, aggressive and in your face way of playing with minimal space needed. Who would I recommend the game to? The game rules are easy to grasp for anybody, really, but I think that the aggressive nature of the game may be a bit off-putting for some newer players. If they have a background in some games or are not offended by being attacked and having to attack, then I think they’d enjoy – but if they enjoy games where you don’t need to attack other players to win, or to be attacked, then it may not be something they will look forward too. Also, it acts as a great gateway game for gamers who come from maybe a video game background, as the rules and the gameplay mirrors traditional fighting games fairly closely in my opinion. Lastly, I’d recommend the game to people who enjoy card games that offer a great deal of strategic thinking – where you need to pay attention as closely to the next five turns as you will the turn you are playing right now. Add a Review for "Yomi: Complete First Edition"